HAWKEN is a little game (it started as an Xbox Live Arcade venture) that has turned into a huge franchise, complete with comic books, video shorts and other tie-ins. In fact, the game launched a new publisher, Meteor Entertainment, and has attracted $10 million in funding from the same venture capitalists that backed League of Legends. After a lot of viral videos, Adhesive Games finally allowed media to get hands on with HAWKEN at E3. Jason Hughes, producer of HAWKEN at Adhesive Games, talks about what’s new with the first-person shooter Mech game that runs on Epic Games’ Unreal Engine 3 in this exclusive interview. 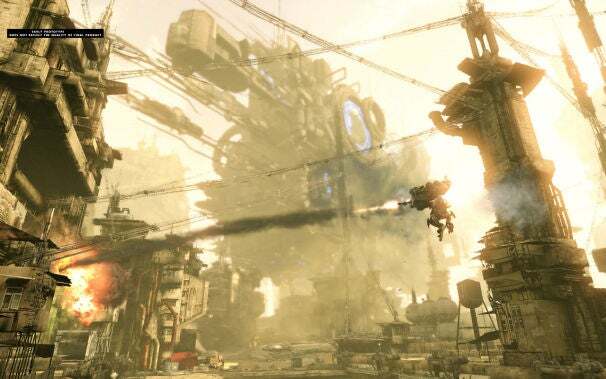 Game On: What’s the focus for HAWKEN at E3? Jason Hughes: At E3 one of the biggest things is really giving journalists hands-on time with HAWKEN. It’s the first time they get to sit down and play unguided, if they want. The game has such a huge focus on customization, people can see what some of that offers, picking a class of Mech, picking weapons, choosing a camo pattern and additional paint schemes, adding attachments, diving into the skill tree, and seeing what HAWKEN will offer. What are some of the customization options in HAWKEN? There are two Mech types, light and medium Mechs, playable at E3. Once you choose a Mech, the player picks a primary weapon like a slug rifle, flat cannon, or Vulcan. These guns have higher rate of fire. There are also secondary weapons like the sniper rifle, hellfire missile, and tow rockets, which offer a bigger punch but greater cool down period. They’re not to be used all the time like the primary weapons. Can you explain how the skill tree works? Once you have selected your weapons, you can go to the skill tree and choose from offensive, defensive or agility/movement. As you play, you’ll unlock points that can be allocated to these three skills and upgrade your Mech. Putting enough skill points into these areas will unlock abilities that your Mech can do that others can’t. So on the playing field your Mech may look identical to another, but it will play completely different. How do the attachments work? Attachments are small little offensive, defensive and movement buffs that offer incremental increases like a plus-5 percent on damage. They’re a little bit of an added bonus. It allows players to bypass the skill tree and not worry about assigning points. One example of one of these equipment boosts is the booster attachment, which will give you a small percentage of extra boost when you want to use it. These aren’t super large boosts, but for those who want to focus on much more specific and technical game, we’re providing that option. What maps are playable at E3? We have three maps. The brand new map that’s currently nicknamed “Alleys”. It’s different from what we’ve shown before. It has some similarities to Andromeda, the map most people know from the videos, in that it has the same architecture and signature look of HAWKEN. There’s ash in the air, clearly demonstrating that there’s some sort of fire and destruction off in the distance. The color tone is different. The sun looks heavy and orange. It’s a little surreal. The levels are much tighter, claustrophobic. There are little battle areas pieced together by choke points. People have to go through alleys to find each other, which makes combat different. Team Death Match is playable on this map. Can you talk about Andromeda? Most people have seen this green and teal hued map, which is actually bigger than other levels and has more space for our new Siege mode. The reason we’ve shown this most often is because it captures the core tone of the game. Other maps offer a variety of looks, but Andromeda’s architecture, its not-to-distant future with billboards with advertising and overbuilt nature, is unique. It feels like it’s been overbuilt, with a corporate shadow over the world. It’s this blocky architecture that has become a part of what HAWKEN is to people -- not only in buildings you’re fighting around, but also seeing out to the distance. Blade Runner is a really big influence for the team and you can see that in this map. What makes Blade Runner so special. It feels real, but it has a sci-fi feel and you don’t feel like you’re looking at something that’s too crazy. We’ll have team death match and siege modes playable. What’s the other map you’re showing? Sahara is the desert map from an early video. It’s a good way to easily find people. It’s more open and doesn’t have a lot of verticality. It’s a good one for people to get a feel for how the game is. It features some very big, more futuristic-looking elements. If you take Andromeda and make it more barren and then imagine a sandstorm has come through, that’s Sahara. There are dunes, there’s a sandstorm always gently blowing in background and that can affect your Mech’s abilities. It’s an older town that has been taken over by sand but it feels like it’s part of the universe. You can see more in this level because there are fewer buildings. We’re not showing the entire map at E3. We portioned off some of it with the intention of making it easier to jump in and get a feel for the game. We’ll have team death match playable. How many players will be playing in these game modes at E3? For launch we’re still working out numbers, but at E3 all maps support five versus five gameplay. We tinkered around with this the last few weeks, it’s a good mix for all maps. The action is always going on. It doesn’t feel like it’s too slow, but you do have the chance to play. If you pump in too many people, you end up dying. It’s the first time people are experiencing this game and we want them to keep playing. If you put too many people in there it was too chaotic, too few people it was too slow.